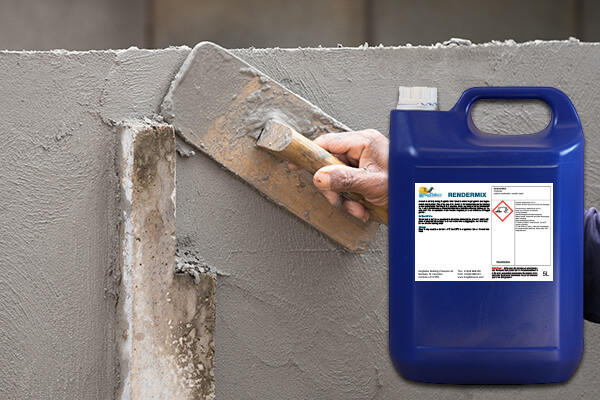 Kingfisher Rendermix is formulated specifically for use during rendering after the DPC injection process. Incorporating a powerful fungicide, this compound provides a great, smooth wall. This waterproofing rendermix also prevents further damaging fungal growth from occurring. The reason Rendermix is so effective is that it does not form a vapour barrier. Instead, it allows the wall to dry out naturally without the creation of damp patches through and onto the final skim coats. The Kingfisher Rendermix has the ability to be used both internally and externally. It prevents the passage of salts, keeping renders strong for a long time. Our waterproofing rendermix can help prevent and control algae and moss growth while preventing any potential outbreaks. Because of its quality and waterproofing properties, it offers outstanding durability and an enhanced finish. The Kingfisher external and internal rendermix is one of the strongest and effective products available. We have a wealth of experience manufacturing high-quality damp proofing products. This will ensure that you are never let down by our products.